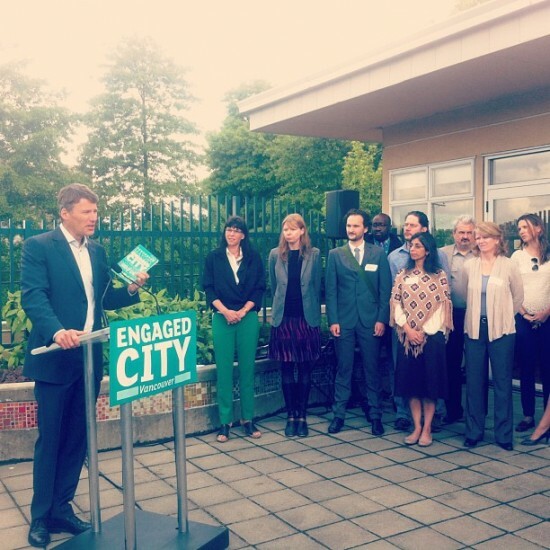 The City of Vancouver has recently announced that it will be using four city-owned sites to develop affordable housing. The announcement has been widely praised even though the policy contains no guarantee that the rents will be affordable. The four sites proposal approved by council does not specify rent levels or rental mix in the proposed buildings. Like previous Vision Vancouver initiatives, the project is clad in vague and uncertain terms that prioritize market profits over affordability. Worse still, the affordability requirements will be decided behind closed doors and hidden in a private “operating agreement.” This means that the public will never know how many units will be affordable or what the rents will be. The four sites have been in the planning process since at least the spring of last year. In August 2012 the City released a Request for Expressions of Interest for six sites of city-owned land, which would be leased for 99 years at a nominal rate for the development of affordable housing. Since then a consortium of non-profit partners led by Land Trust has been selected to lease four out of six sites (contracts for the other two sites have not yet been announced). The Land Trust was established by the Co-operative Housing Federation of BC and is a non-profit charity. Land Trust and partners’ submission involves utilizing four of the six offered sites to create approximately 355 new units of housing. One of the sites, overlooking the Fraser river, will be used for the development of 82 luxury market rental units, which in turn will be used to subsidize the affordability of the three other sites. However, there are at present no guarantees that three other sites will have affordable housing, and the rental mix will be specified in an operating agreement that will not be approved by council or made public. The city’s definition of social housing has increasingly loosened since the election of Vision Vancouver in 2008. The most recent case is Heather Place, where Councillor Geoff Meggs has recently written that the redevelopment of the public housing project will include “86 units of social housing.” The vast majority of these 86 units will rent for unaffordable market rates, with a one-bedroom apartment going for a minimum of $1,300 per month. This kind of “social housing” can only materialize when people gain external rent subsidies, which are limited, temporary, hard to apply for, are not tied to the unit, and are not granted to all tenants who need them. The exact rent or affordability for the four sites project is not specified and the expected rent is expressed in vague averages. Already in August 2012, The Mainlander criticized the project’s RFEOI for not specifying firm rent requirements. The report clarifies that the reason for lack of firm requirements is that affordability of the housing units will be set out in private agreements, which will not be approved by city council or made available to the public. Furthermore, any such requirement are likely to fluctuate over time according to City staff’s analysis of market conditions. The lack of transparency is deeply concerning in light of the record at the Olympic Village and Little Mountain. Nowhere in the four sites report is the affordability of the projects guaranteed, and the development is framed with a constant acceptance of the imperatives of the free market. Welfare rate housing units and low income housing units across the city are being lost as rents continue to rise. In the last year alone, 426 welfare-rate units were lost in the DTES. Yet the four sites initiative makes no effort to counteract this trend and in addition to making no firm affordability requirements, there is no specification of the proportion or absolute number of units that will cater to people on welfare. Nor is there any commitment to housing for the 42,000 tenants making below $20,000 in the City of Vancouver, which is disproportionately made up of indigenous people, people of colour and recent immigrants. Following the Olympic village experience, the number of housing units serving those below the poverty line could very well be close to zero. The four sites project ominously models the Olympic Village. Both are modeled on the P3 approach of cost-recovery in which the little remaining social housing is rented to the higher income tenants. In the Olympic Village, the low-income and welfare tenants were expected to apply and qualify for grants and supplements in order to afford living there. Since moving into the complex, tenants on low and fixed incomes continue to be double-billed for utilities and charged for cold water and other fees. One tenant at the olympic village writes in a comment to a recent article, “I cannot afford to shower more than 3 times a week and do dishes and laundry with as little water consumption as possible.” As a result of continued supplemental costs, many tenants have been displaced from the project while other are squeezed to the limits of their income. Similarly, the four sites project makes no mention or cost evaluation regarding utility costs and other fees to be levied on future tenants. Another striking similarity is the rental mix of the four sites buildings. The actual rental mix will only be decided later on in the development process and does not have to be approved by city hall. Again, the actual rental mix of the buildings, which is never specified, is left unclear and hinges on a perpetual if. The report’s vague statements on the rental mix of the buildings raises the question: what is the exact mix and the exact range of rents? Given the recent record of city council on affordability, it is difficult to deem the four sites affordable before having answers to these essential questions. Privatize the profits and socialize the losses. It’s the only way seen here by “our” civic government to “involve” the private sector in “city service provision,” if in fact one sees rental housing as a necessary city service in the first place. I do, but many don’t. The devil is in the details. It is not enough in this instance that public land is being given away free for use by this new private special purpose vehicle (SPV), “non-profit” or not. A private company determines how much it will make off this public land and agrees to kick back whatever it feels is left over, above and beyond its needs. If it looks like there is “nothing left over,” such as if its expected “market” rents are not realized, nothing will be. While the going is good, this SPV will compete in the rental marketplace against private developers but without paying for the land. How is that at all fair?! Are we just picking a winner and playing favourites? If this SPV indeed does make a profit–and how on earth couldn’t it?–it has pledged–presumably–to use some of that profit to subsidize other units it controls on city land. How is this even possibly a fair deal for the public, who own this land in the first place? Give away your land (for 99 years), and maybe this SPV will rent it back to you for what it determines you can afford. Are we turning into a fully privatized company town like so many that existed in the 19th century across North America (viz. Pullman)? Hmm. Maybe we are already there, and it’s worth remembering what happened in Pullman, Illinois in 1893. The proof of this latest scam is the secrecy, just like so many other recent scams in BC including BC Rail, the RAV/Canada Line, and the Sea-to-Sky Highway. If this were to be any kind of true and honest risk-sharing P3, where the private sector–in this case a nominal non-profit–takes a significant risk of losses in exchange for potential gains, then the case would be made clear and the details could be released. It obviously is not. This is a clear scam where public land is being released to private use with no protection of the public good. Compare this horrific situation with the open and transparent provision of public rental housing by civic governments from Paris to Hong Kong, in tens of thousands of OECD cities. The need is clear. Every city has a strong economic, moral, and social incentive to help provide housing and ensure people of all incomes can live safely and securely close to the jobs that are available and demanded in that city. In some utopian world, everyone would earn enough to afford what they needed, and then the market would allocate everything fairly. But our world is not that one. Many jobs in the city pay far far below the mean; some work as nursing aids and others as surgeons, and our society generally values those jobs at far different rates. So some will thus have less, far less to ensure their basic needs and human rights, of which shelter is one. In steps the civic government, literally everywhere in every country on earth, to provide a floor in the competitive marketplace, a floor below which its poorest citizens do not go. Shelter you see is a human right, protected by international treaty, the 1948 Universal Declaration of Human Rights under Article 25. And yes, Canada has signed this treaty, which provides for the provision of housing for all. Civic governments, generally through a Housing Authority, build public housing on pubic land and rent this housing for a percentage of the income of the tenants, generally 20-30%. Even at these guaranteed low rents, there are very few Housing Authorities on earth that are subsidized by the taxpayer. Well-built and well-maintained housing returns far more to the city than similar private housing through taxes. In fact, many cities receive a significant portion of their public revenues from their stock of rental housing. They are thus not trapped by an overreliance on property taxes and the 8% tax trap that so many Canadian civic politicians decry. If you want examples, Toronto provides 160,000 people with housing on public land in public buildings, in over 50,000 apartments of all sizes. All rents are means tested. Some are subsidized additionally by provincial programs. Certainly there are scandals there, but we hear about them and the problems are resolved. Then go to the most expensive city on earth, Hong Kong. Of the 7.7 million residents there, over 40% live in 1.3 million public housing apartments, all owned by the city and providing affordable rents by right. Go just north to Whistler, and the Whistler Housing Authority provides affordable housing to employees so fewer die commuting late at night in blizzards to Squamish and Penticton. All of this only makes sense. But here the Vancouver Housing Authority ceased to exist in 1968 after a 16-year run, its housing assets plundered and privatized, turned over to BC and then Metro Housing, which then continued to neglect and then privatize them (viz. Little Mountain and now Heather Place). Vancouver is unique in the developed world for its very wide income differentials, extremely poor quality and quantity of housing, high numbers of homeless, deplorable public health standards, poor productivity, low levels of entrepreneurship, brittle economy, low respect for heritage, poor treatment of aboriginal people, and I could go on. Almost all of these ills would be significantly alleviated if safe, secure, and affordable housing were available. The only path forward, well-tried and tested worldwide in all cultures, is through public housing. Housing is a basic human need, right after water and then food. It is also a human right, which we cannot morally deny. PS – Thank you Maria for bringing this truth to the public eye that they may someday see our world for what it truly is, not some spin-doctors plaything but the destiny of our souls. Gov’t must not be in the business of developing housing, because thay are not in the business of developing housing. When they lack skills and do someody else’s job, it is wasteful and inefficient. But what really makes that a big problem is that it’s not their money, which is the incentive for waste and inefficiency. Whenever they do build, it is only for symbolic gesture to appease people crying for this method of delivery. And, whatever they build is a very small portion of the rental universe, which creates a lottery-like, have and have-not situation for those in need for low cost shelter. It actually creates more losers than winners. The solution is simple, and it is simply a return to what we had in the past. A generous supply of used housing, made available by the previous residents, who have the ability to move up into newer housing. That means all low-density neighborhoods with near-obsolete SFDs surrounded by big lawns with one or two occupants need to evolve, as all cities have done for thousands of years. With a healthy supply of used, aging housing, people will have much more choice on how much to pay, and where. You may not like evolution, but your city is going through it continuously. Can’t be stopped. This region is growing rapidly, and for the next couple decades, almost 55,000 people come to Metro each year. That’s 150/day. Per day. Most have enough money to comfortably enter into the housing market; rent, lease or buy. For the others that don’t have the means, they are slitting their own throats. The corollary is someone who decides moves into a small, near-deserted town in interior BC and demands meaningful work. Both sets of people should not expect significant subsidization from strangers through mass taxation, from people who are also having challenges with housing costs and limited disposable income. Call all you will for an expansion of gov’t built housing, but it is not going to happen. Under ANY gov’t. That was another era. What is needed is for activists to start supporting the vast amount of housing that is ready to be built privately; ranging from large-scale professional developers, smaller-scale builders, to ma-and-pa investors, and to a couple simply wanting to add a suite. The great thing about this approach (vs. gov’t) is that (a) it can much quicker (b) the amount of housing created (and used housing freed up) is immense, and (c) if the provider makes an error or is greedy, the risk is theirs and they bear the costs.